Our students, Jakub Adam, Monika Filipčiková, Andrej Švec a Filip Vozár will have a presentation on April 10, 2016 at 14:45 on the MS Fest conference, within MS Fest, a conference, that takes part in the building of Faculty of informatics and information technologies of the Slovak university of technology in Bratislava. They will talk about their project moderateIT, which they participate with also in an international competition Imagine Cup. You´re welcome to this presentation. Abstract. As internet is growing, people are getting more oportunities to be connected by a wide range of devices: computers, smartphones and tablets. The freedom of communication is loosing borders. People have the pleasure of confidentiality and thus become more open. Sometimes, they are so open, they even behave unpolitely and rudely to others. Communication and user content on the Web became unregulated. 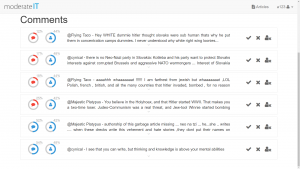 Comments and open discussions easily became a place of hate and offensive behaviour. Disscussions contain vulgarisms, ad hominem attacks, offensive words and many other forms of malicious behavior. All this leads to either closing of discussions, companies paying extra money to manage communications on their web sites, or social disgradation of people. We think that communication has to be managed, not ommitted. We can’t close eyes on this situation. Our goal is to get rid of poisoning and unpolite comments in online disscussions. Dealing with this issue costs companies, such as news portals, considerable sums of money. 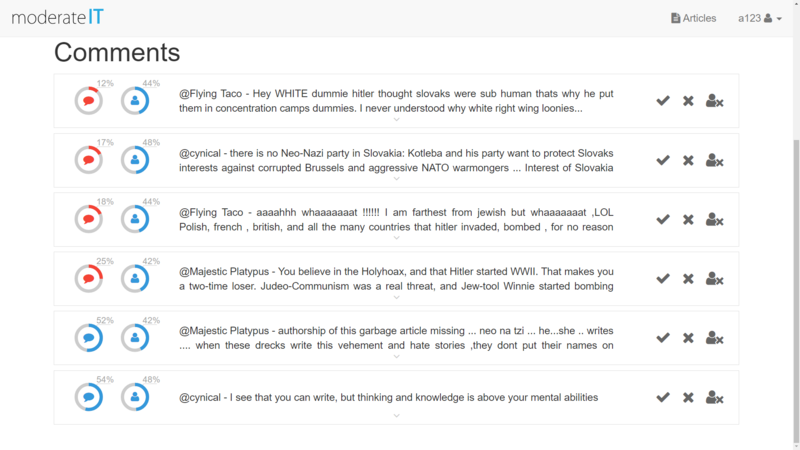 Our automated solution helps human moderators to quickly detect problematic comments and keep the discussion focused on a given topic. It will also prevent unnecessary conflicts between discussion participants. We created a service that runs on Microsoft Azure Platform and classifies comments based on their appropriateness to the discussion. Our service uses many Azure services such as Azure Text API and Azure Machine Learning.